We have a new Christmas offer our hearts glad we overburdened DOUBLE DOUBLE JOY = 26 to 29 December. 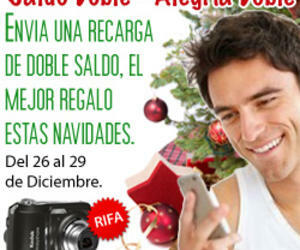 The period of this promotion is from the December 26, 2011 at 00.01 (in Cuba) until December 29 at 23:59 pm (in Cuba). The promotion applies to 20CUC recharges up to 50 CUC CUC. Both nominal charge as an added bonus has no spending limits. The bonus can be used on all services available to prepaid customers at the same rates Cubacel existing prepaid customers. The life cycle of the line is 60 days to consume the balance and an additional 30 days to recharge (as current). This promotion is conducted at Cubacel. The amount indicated on the ticket received confirmation of the charge does not show the extra balance of the promotion, however, the phone will receive the promotional balance. Double your recharge promotion from the outside, is to provide customers www.RicaricaCubacel.com www.RecargasaCuba.com and the possibility of doubling the amount recharged in this manner, less than 20.00 CUC and equal to or less than 50.00 CUC, which will be enjoyed by users of mobile telephony in Cuba. • Both the nominal and the balance recharge free (bonus) have no time limit for consumption. • The bond may be used for all services available to prepaid customers Cubacel. • Target: Cubacel prepaid users (beneficiaries of the promotion) and International Distributors Customer. • Point of Sale: Throughout the sales network of international distributors. • Validity Period: from 26/12/2011 at 00:01 hours on Cuba (GMT-5) to 29/12/2011 at 23:59, when Cuba (GMT-5). • Fees: The use of the bond will apply the same rates that currently exist for the prepaid segment. We also have promotion during this magical rifaremos 2 C1530 Kodak Easyshare digital cameras every day. You can be the winner and the most beautiful gift this Christmas if you only have to do a recharge www.RecargasaCuba.com during our double promotion balance.